In my drawings I make dynamics visible, what I have experienced undergoes immediate transformation and appears on paper as a line of movement or field of lines. 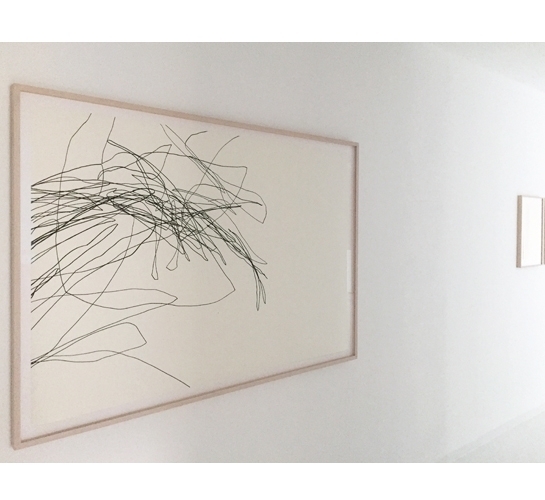 The lines in Karoline Bröckel's drawings seem familiar to us. Their course reminds us of movement sequences that we usually perceive with the greatest attention as a child and later as adults. Everyone has followed the course of an ant with their eyes, its inexplicable back and forth in the terrain or the gliding of swallows in the sky. Bröckel has observed these movements for many years while drawing and records them with black ink in the case of swallows and red in the case of ants on small-format leaves. The line begins in the middle of the leaf at the moment when the eye catches the animal and ends when its course or flight leads the hand out of the leaf space. In the drawings in the group of works called "Aufzeichnungen, überschrieben" Bröckel reacts to short pieces of music that she hears in endless repetition and translates into line sequences, in case of the large drawings lasting several hours in one day (110 x 148 cm). Since the beginning of her artistic work, she has created drawings in the group of works called “Stapelstriche“. Unlike all other groups of works, Bröckel draws these in quiet moments without any external stimulation. She draws lines of millimeters, one above the other without touching eachother. These stacks of lines become lines that run through the mostly vertical sheets from the bottom to the top. Karoline Bröckel was born in Tübingen in 1964 and lives and works near Munich. Her drawings were part of important institutional drawing exhibitions such as "Drawing as Process" at Museum Folkwang Essen 2008, "Walk the Line" at Kunstmuseum Wolfsburg 2015, "Zeichnungsräume" at Hamburger Kunsthalle 2016 and 2017 in "Die Linie ist Gedanke" at Gallery Stihl in Waiblingen.